A Delegation of Tourism stakeholders led by Shri M.VINOD President, AATO met Honourable Lt. Governor, today at his office and discuss various Tourism related issues which were submitted to his excellency through AATO letters dated 04/08/2017, 24/08/2017 and Joint representation on 21/09/2017. 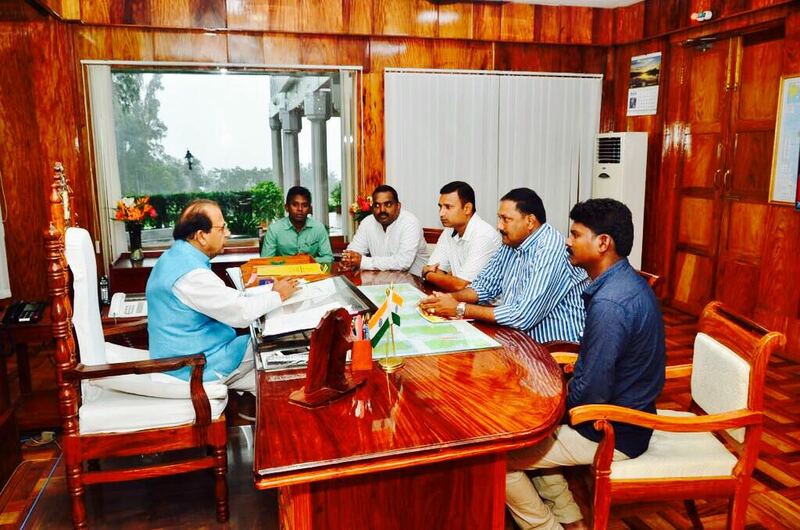 The major issues discussed were shortage of Boats for Neil and Havelock, plying of Coral Queen for Havelock, Passenger service fee, and Basic amenities for Tourists, Parking Place for Tourist Vehicle and issue of Manual tickets for Sound and light show. The Honorable Lt. Governor gave patient hearing to the delegation and assure look into all the grievances all the stake holders. We express our sincere gratitude towards the Lt. Governor for giving time to our delegation among his busy schedule. 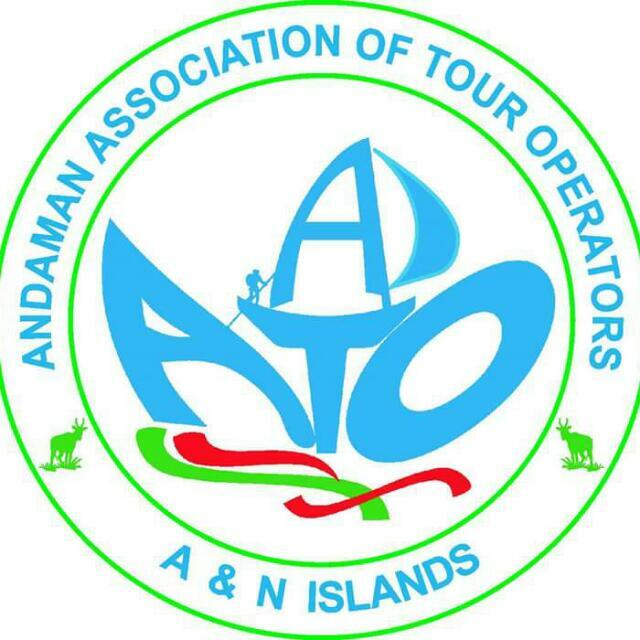 It is, in the capacity of President Association of Tour operators, Andaman & Nicobar Islands, I would like to draw your kind attention towards the grievances of Travel Agents, Tour Operators and other related Service providers with a request to draw your immediate attention and to find quick solutions. Here are some important issues raised by the Travel Agents, Tour Operators, Boat Operators and Car Operators for your kind consideration which have hindered, and which are hindering the tourism industry at the Islands. 1 . 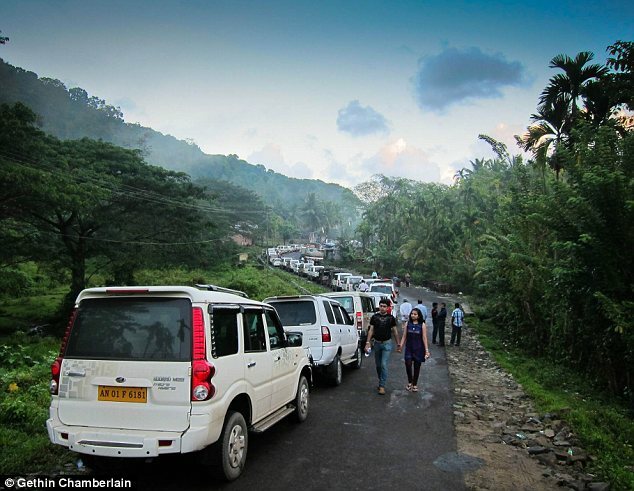 Closure of ATR Road- your Excellency, it has come to our knowledge that the administration is introducing sea route for Baratang, which the stake holders feel will definitely effect the livelihood of hundreds of unemployed youths who have purchased tourist vehicle through bank loan and drive their vehicle on Baratang route for their livelihood. Your Excellency, everybody is aware of the shortage of Govt. boat in the present day and it is difficult to believe that Govt. which is short of boats will operate boats for Baratang. Introduction of boat service will definitely create chaos among the visiting tourist as we feel all the tourist will not be able to visit Baratang due to shortage of boats. Your Excellency we kindly request you to think of this un-employed youth before taking any major decision regarding ATR.As we feel the road to ATR should be open for vehicles to carry tourist. 2. Introduction of passenger service fee by PMB- Your Excellency , we would like to inform you that the port management board has started charging Rs 50/-and Rs 20/-per port from every tourist which comes around Rs 200/-as an extra burden for every tourist and as all the tour operators have already quoted their rates, to the guest, this additional charges will bring a bad reputation to the tourism industry. Your Excellency, further we would like to inform you that PMB is charging passenger service fee without providing any service to the passengers. We kindly request you sir , to reconsider the decision of charging of passenger service fee by PMB. Your Excellency, in this regards AATO has already requested for exemption through AATO letter Dated 1st and 14 august 2017. 3. Basic amenities for tourists- Your Excellency, we request you to Improve and provide clean and basic amenities like toilet, change room, life guard etc., in all the tourist spots. Whether any agency has taken a complete stock of the situation and ensured these facilities for tourists at all tourist locations, Islands? Tourists have been complaining lack of these basic amenities, the Travel Agents/Tour Operators are facing the embarrassment!! a) Shortage of Boats- your Excellency ,it is always noticed that there is shortage od DSS Boats during peak tourist season for Neil and Havelock islands, sir every year we request the Govt. for plying of bigger boat for Havelock and Neil islands. But it is seen that for reasons unknown only small boats are operated by Govt. during peak season. b) Plying of boats from Havelock to Neil Island- your Excellency, we would like to inform you that the DSS was plying a boat from Havelock to Neil island daily in the morning, which was a great help for the tourist which as stopped for reasons known to the Dept. Your Excellency, there are two boats from DSS for Havelock daily morning and if this boats can be asked to ply from Havelock to Neil and to Havelock we are sure that lot of tourists will be benefitted. Irrespective it is peak season, winter, or monsoon, enough fast boat services between the Islands like Havelock, Neil are essential. At present, there are hundreds of complaints from Tourists for not providing even Government run ferries for tourists. The entire system should be planned well and implemented, unfortunately this is lacking in the islands. 5. Lack of Coordination between Administration and Stake Holders- your Excellency, we feel there should be Equal participation of stakeholders in all matters related with Tourism .and also Coordination committee of Stakeholders should be made active and we request your participation in all such meetings for the development of Tourism. Your Excellency, as on present date we feel all the decisions in tourism industry are taken and implemented without the consultations of any stake holders. Your Excellency, At the end we would request you to kindly consider all our points for development of Tourism in this Islands as we know tourism is the only surviving industry of our islands and there are thousands of people Involved in this industry earning their livelihood. Your Excellency, we look forward to you with great expectation and hope. As we feel this problems will definitely be an obstacle for development of tourism in our islands and also will bring negative publicity for Andaman tourism. The Chief Secretary, A&N Administration, Anindo Majumdar on Friday cleared that the work for Alternate Sea Route connecting Port Blair and Baratang has been completed. He said that the route will commence from 1st of October 2017, with government boats starting to ply in the sector to begin with. The Chief Secretary also said that the Administration is working on modalities to bring in private boat operators to ply in the sector after the route commences. Opening up of alternate sea route by the Andaman & Nicobar Administration is being taken up in compliance with the Hon’ble Supreme Court of India’s verdict. The Administration will be shifting tourists from the road to sea as per the commitment made before the Hon’ble Supreme Court, he said. Meanwhile the road that passes through the Jarawa Reserve Forest will remain open for islanders, he added. 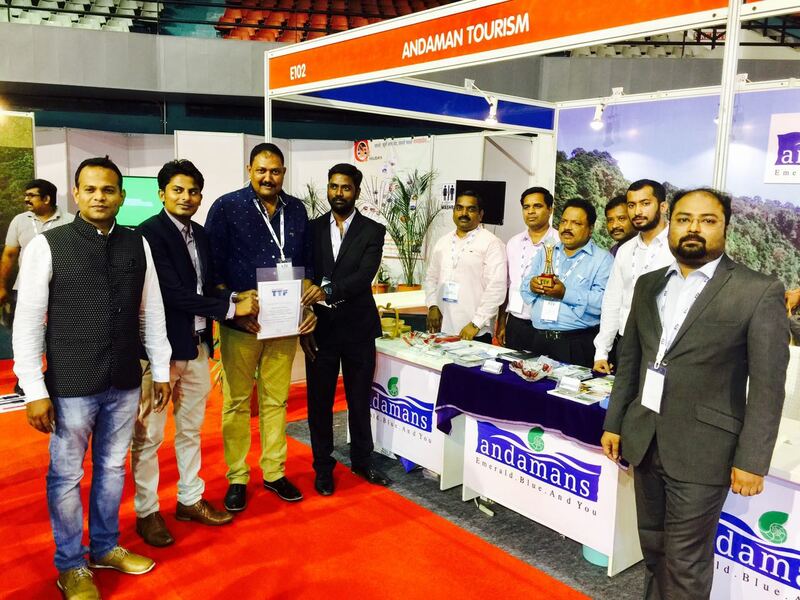 Andaman Tourism which participated in the ongoing TTF at Surat along with Andaman Islands Tourism stake holders has bagged the award for The Most Innovative Product for the presence of Under Water Sea Walk at Andaman Island. The award was presented by Mr / Rajiv Agarwal ,Managing director of Fairfest Media Ltd and was received by Shri Basudev Halder ,Manager , Andaman Tourism.